Like the stones holding up the fortress, Khador’s massive military is built from its citizens. Every capable Khadoran is added to the list of possible conscripts—if he does not enlist on his own, of course—sometime during the month after his 17th birthday. Most young men enlist as a matter of pride, and a good number of women follow suit as well. The enlisted majority become Winter Guard, the backbone of the Khadoran military. Some survive and graduate to higher roles such as the prestigious brotherhood of Iron Fangs or the imposing Man-O-War shocktroopers who fight alongside the most powerful warjacks in all western Immoren. 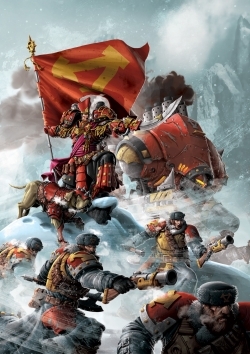 The massive armies of Khador personify their ideals: strength and resilience over all else. They are trained to smash an enemy’s defenses with decisive strikes but are more than ready to dig in their heels and outlast any force in a war of attrition if necessary. They are glorious to behold in their solidarity as they march, often hundreds deep, with Khadoran pennants whipping above their heads and flanked by titanic warjacks that shake the ground with each step. Many confl icts have been quelled without a single casualty when such a force marches into the area, for their reputation marches with them. The queen commands Khador’s legions through her High Kommand. This group of venerable career soldiers have defi ed the odds and retired from the field into prestigious positions. They lead not from behind a cannonade on the battlefi eld, but from the great war room chambers of Stasikov Palace in Korsk. Although they defer to the queen—who oft reminds them by directly commanding their offi cers—they comprise the main wartime minds that have her ear at all times.